"IT Asset Management Software Comparison"
Enterprise asset management solutions are seeing increasing demand in private and government agencies. Choosing the best IT EnterpriseAsset Management solution requires a comparison between them. On what criteria should we compare different enterprise asset management solution, providers? What is the scope of the “must-have” functionality in an IT asset management solution? What are optional “nice-to-have” features and functionality in an IAM Solution? Which are the major providers of Enterprise IT asset management solutions? This whitepaper presents a summary view of the competitive landscape of the providers of IT asset management solutions for different sizes of businesses. 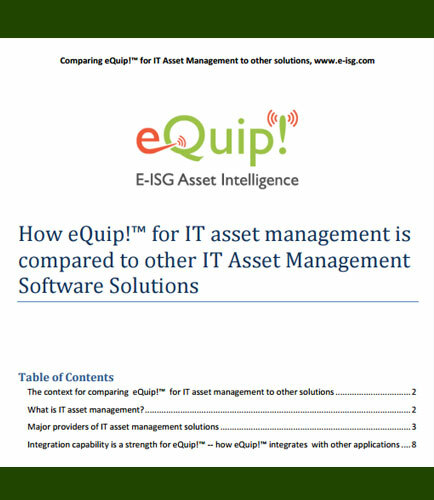 Learn the pros and cons with different IT asset management solution providers by downloading this whitepaper on ''Enterprise asset management software comparison''.